Garmin has recently released new 7" Garmin Nuvi and Dezl GPS systems. These units have awesome features some of which are not found in any other factory or aftermarket I've seen and I really like Garmin's mapping technology. However, I'm tired of having this large GPS sitting on my dashboard (likely a magnet for theft not to mention the real estate it takes up on the dash). I would very much like to install the Garmin Nuvi 2797LMT 7" GPS with a factory OEM look much like the attached pic if it is possible. 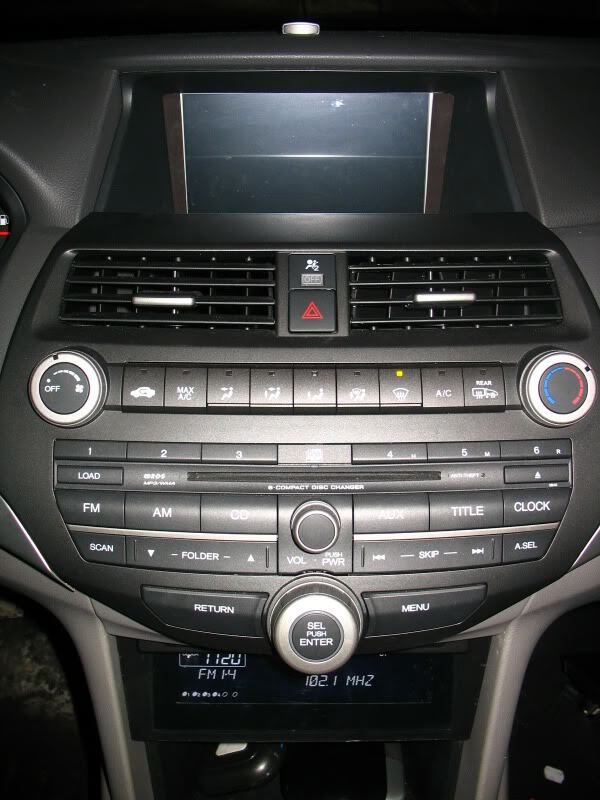 Hopefully the Honda radio LCD screen could be relocated to the bottom of the console storage area (perhaps longer cables are available from somewhere). However, I'm just not sure how the Garmin Nuvi would fit and I was hoping perhaps someone has tried this or knows where you can get a kit for aftermarket installs. I don't want the Schoche panel which replaces your temp controls with a touchscreen. Instead, I want a 7" Garmin in the area designed for the GPS screen. 2. Where can I get the black plastic trim bracket for the radio LCD to be relocated lower down as shown in the pic? 3. Do I need to buy a cable extension or harness to move the blue radio / climate LCD from the top to the lower section as shown in the picture? hondapartsdeals.com will sell you the factory panels at dealer cost (my dealer confirmed). i've bought from them over the years and always get original OEM parts. people have put an aftermarket GPS in that location. the concern you will have is if reception will suffer with that location. it varies with each unit and the antenna placement. i put mine out of the way and routed the cable down the apillar. it is not visible from outside the car, nor are any cables, and it's easily accessible. the only downside is i can't see the whole screen when the sun visor is down. 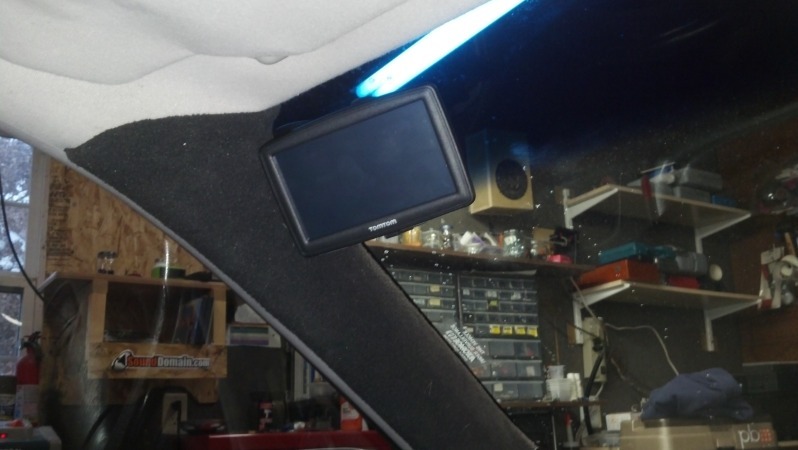 The problem for me is that I want to get the new 7" Nuvi 2797LMT or Dezl 760LMT (with backup camera input) and that's way too large to stick up there. Plus I'm tall so that would be in my face and a bad area for me. You have me thinking about the reception thing. 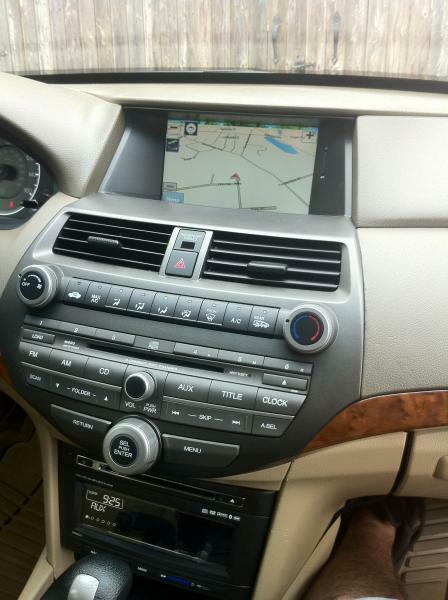 I wonder if anyone can attest to the reception of a dashboard integrated Garmin Nuvi / Dezl GPS and how the reception is. Unfortunately, these models do not have an external GPS input so my options are limited. The last thing I want to do is go through the hassle and then find out that the reception is no good rendering it useless. Power setup for Garmin Nuvi? Quick Reply: Accord 8th Gen Garmin Nuvi GPS Aftermarket OEM Installation / Display Retrofit HELP!